The Log API is built for the purpose of providing true end to end logging across all your integration platforms and even your custom solutions. Nodinite Log Agents uses the Log API and so can you. If these out of the box solutions are not enough for your needs then you can always code and send Log Events using either REST or WCF. You can use the Log API to log data such as events and messages from any node.js, .NET, JAVA (and many more WS* compliant platforms). Your data is eventually stored and archived in encrypted Log Databases. 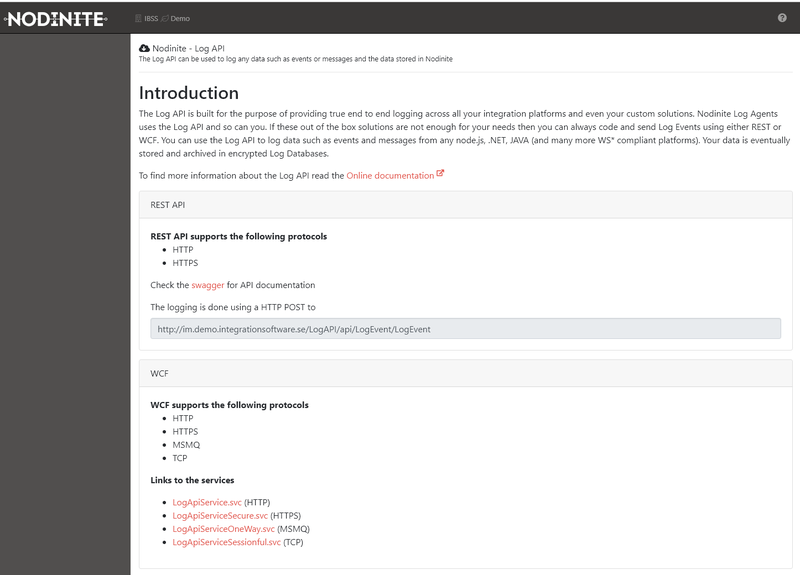 The Log API is a Web Application hosted within IIS and is installed as part of the Core Services package. See Prerequisites for pre-installation related information. Nodinite provides self service to logged data with role based Log Views. The Log API has a help page to get you started quickly. Easy create your own custom logging solutions using since the API documentation is based on Swagger. Common problems and FAQ for the Log API not found on this page can be found in the troubleshooting page.